What it lacks in size, Scotland’s canal system makes up for in sheer quality, as this stranded northern outpost of the British network offers some of most famous and historic canals in Great Britain. From the dramatic Caledonian Canal in the Highlands and the pictorial pleasures of the Crinan Canal in Argyll and Bute down to the Forth & Clyde and Union Canals, Scotland’s recently revived and restored 137 mile canal network offers navigators a Scottish experience that is manageable while at the same time replete with history, wildlife, atmosphere, engineering marvels and breathtaking scenery. What’s more it offers a bracing northern break for those well acquainted with the charms of the canal sprawl further south. Passage down the canals of England can certainly conjure up some pretty dramatic and majestic scenery from time to time but even its most ardent admirers would be hard pressed to pin-point a waterway that could match the truly spectacular route enjoyed by the renowned Caledonian Canal. This masterpiece of canal engineering, running some 62 miles through the Highlands from Inverness to Fort William, is unquestionably one of the great waterways of the world. It is a heavenly union between the man-made and the natural; the canal itself is made up of both an artificial channel and the four lochs of Dochfour, Ness, Oich and Lochy that it links up and its attractions on route encompass the incredible unspoilt Highland scenery and the engineering triumphs of its four aqueducts, ten bridges and twenty-nine locks - including the eight-lock Neptune’s Staircase. With its majestic vistas of glens and lochs The Caledonian Canal offers international visitors a realisation of the romantic ideal of the Scottish landscape. In fact if it threw a diversion up to Edinburgh Castle you’d even think it had been created by the country’s tourist board. Still it does have an even bigger draw in Loch Ness, which in its 750 foot depths is home to one of the nation’s most enduring legends. 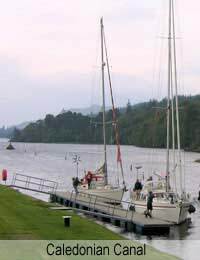 The passage across the famous loch is a suitably atmospheric one and, with the incredible water depth beneath, is more reminiscent of cruising coastal rather than quiet inland waters, particularly if the weather turns. Down in the Scottish Lowlands, the Forth and Clyde Canal presents a more balanced impression of Scotland. Its 35 mile, 39 lock course between Bowling and the Clyde in the east and Grangemouth and the Forth in the west, cuts through some urban grit – not least old industrial metropolis of Glasgow - as well as the obligatory pretty countryside. Furthermore, it might not have the Loch Ness monster but what it is does have is the world’s only rotating boat lift, something more useful than elusive. The 115 foot high Falkirk Wheel that helps connect the canal to the Union Canal is a remarkable work of both modern art and modern engineering. It is only in recent years that people have been able to take full advantage of this canal. After almost two centuries of service providing passage for cargo, rights of navigation were extinguished by parliament in 1963. Since then it lay semi-derelict until tides turned it was restored as part of the £78m Millenium Link project – the largest canal restoration ever in Britain – before being reopened in 2001. The Forth & Clyde canal was not the only Scottish canal to suffer a long ignominious demise before enjoying a Millennium themed renaissance. Its Lowland neighbour and Falkirk Wheel connection, the Edinburgh & Glasgow Union Canal, or Union Canal, is also currently experiencing a new lease of life. Although bracketed by modern developments in the Wheel and the new Edinburgh Quays in heart of the capital, the canal’s 32 mile route in-between is a stoutly traditional rural thoroughfare. Not only is the countryside easy-going, with calming vistas of open countryside and picturesque woodland, but the passage is too, because as Scotland’s only ‘contour canal’ there are very few locks on route. A trip along the Union will also include some engineering landmarks, such as a very dark 631 metre long tunnel through the solid rock of Prospect Hill, as well as some impressive aqueducts in the Slateford, Avon and the spectacular Almond, and also the so-called ‘Laughin’ and Greetin’ bridge at Glen Village, famous for its carved laughing and crying faces. Though at only 14km in length, the Crinan Canal is the minor and lesser known of the Scottish canals, it is no less remarkable, passing through some awe-inspiring scenery rich in history. What’s more as it is surrounded by renowned heritage sites – including Kilmartin Glen - a wildlife reserve and endless forest walks and cycle ways, it could still take a while to complete the route easy as it is to get distracted.